Dhaka, 24 April, Abnews: President M Abdul Hamid has taken oath as head of the state for the second consecutive term. Jatiya Sangsad Speaker Dr Shirin Sharmin Chaudhury administered his oath of office at the Darbar Hall of Bangabhaban at 7:30pm, President's press secretary Joynal Abedin said. Prime Minister Sheikh Hasina, the Chief Justice, former Presidents of the country, judges, cabinet members, lawmakers, senior politicians, foreign diplomats and other dignitaries are were present during the ceremony. 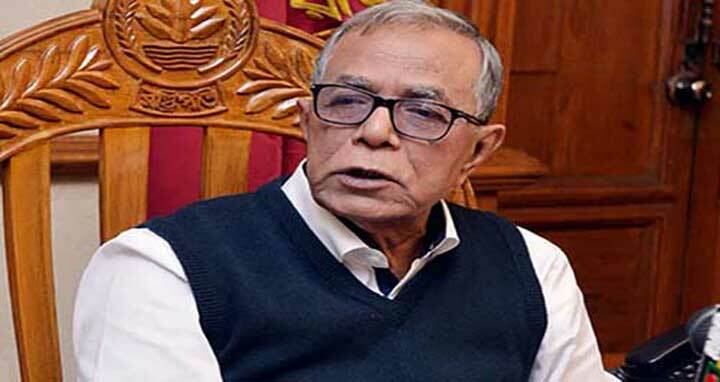 Finding no other candidate in the presidential race, Returning Officer of the presidential election and Chief Election Commissioner KM Nurul Huda on February 7 last announced ruling Awami League candidate M Abdul Hamid elected unopposed as President of Bangladesh for the second consecutive term. The present five-year tenure of Abdul Hamid expires today (Tuesday) as he took office on April 24, 2013.